Ron Z. submitted this photo and caption. The entire Zeilinger family from Huntington Beach, Calif., performed at the DCI West Open Class Championships in Bellflower, Calif. on July 17, 2011. The three units represented are the Rhythm Regiment Drum Corps in light blue, Impulse in yellow and black and the Freelancers Alumni in red. 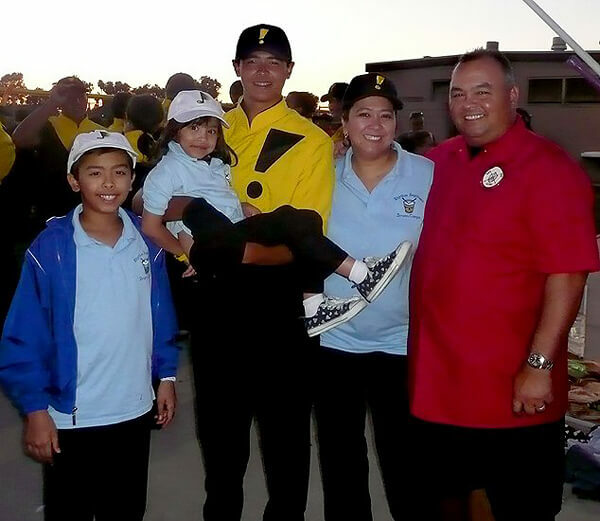 The dad, plays lead baritone as a member of the Freelancers Alumni Corps (and guests), was also a member of the Anaheim Kingsmen Alumni Corps (and guests) that performed at DCI Semifinals in Pasadena, Calif. in 2007, and he is an alum of the "original" Velvet Knights from 1980 to 1985. His oldest son also plays baritone and marched his rookie year with Impulse, which his dad is a co-founder and designer of the corps logo and uniform. The younger two children performed with Rhythm Regiment, which is the young training group that is part of the Impulse Youth Arts Organization family. The Mom, held the banner and helped coach Rhythm Regiment's cymbal line which is made up of three little girls ranging in age from three to four years old. You could say this family "Follows their Impulse!"